조선시대 만들어진 분청사기 병으로 야외에서 술, 물을 담을 때 사용하던 용기이다. 자라와 비슷한 모양을 하고 있어 자라병이라 불리우며, 크기는 높이 9.4㎝, 지름 24.1㎝이다. 병 전체를 백토로 두껍게 바르고, 윗면에는 모란꽃과 잎을 간략하게 나타냈다. 무늬가 새겨진 곳 이외의 백토면을 깎아낸 후, 검은 색 안료를 칠하여 흑백의 대조가 대비되는 효과를 가져오게 하였다. 이와 같은 무늬 장식기법을 박지기법이라 하는데, 분청사기 무늬 중 조형적으로 가장 뛰어나다. 이 병의 박지모란무늬는 구성이 대담하고 활발할 뿐만 아니라 무늬와 바탕면과의 대조를 선명하게 하기 위하여 바탕면에 검은 색 안료를 입혔다. 병의 밑면에도 모란을 선으로 새겨 장식하고 있다. 굽은 낮고 바닥 가장자리에 덩굴무늬 띠를 돌렸으며, 유약의 색은 회청색으로 광택이 있으나 바닥의 일부는 산화되어 변색되어 있다. 박지기법과 검은 색 안료의 사용이 잘 조화되어 분청사기 특유의 대범하고 활달한 분위기가 잘 나타난 작품이다. 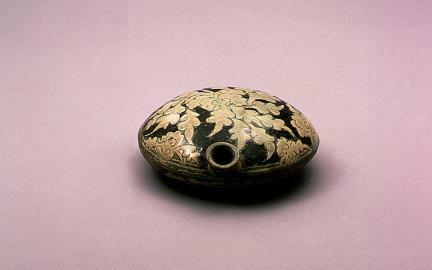 This is an outdoors bottle designed in the late fifteenth century Joseon Dynasty. 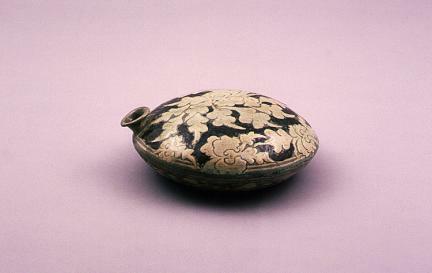 It is typically used for carrying water or liquors. Because it has a shape of a turtle, it is called ‘Turtle-shaped Bottle’. It is 9.4cm high and 24.1cm wide. All around the bottle, thick white clay is applied. Peony blossoms and leaves are painted in free and open manners with simple brush strokes. Some parts of the surfaces are cut out and painted in black, in order to bring out contrasting light and shade. This design technique is called bakji, a method of design by sgraffiato. Pots designed using this technique stylishly represent the buncheong glazed stonewares. The footplate is low, and a vine pattern band is painted along the edge of it. The glaze color is a bright grayish blue, but the bottom part of the bottle is oxidized to form discoloration. The use of bakji and the colorimetric of black and white are in harmony, characterizing this era.